Photo shows a Webb 4ft 6in 2-4-2 tank with "Watford" destination board and a two coach train. Can anyone add anything further? The train is a Watford motor train service. These trains worked mostly a shuttle service between Watford and Croxley Green, and Watford and Rickmansworth. The first carriage is 57ft x 9ft 0in composite trailer car no. 3726 of diagram M.11, which was turned out under account SX.257 on 21/07/14. This was an odd design, with hinged entrance doors in the vestibules, and gangways. The roof profile was also non-standard. It may have been an experimental forerunner of the Euston-Watford electric stock. The rear carriage is 50ft 0in arc-roof third class driving-trailer no. 181 of Diagram M.59. This was of course a conversion from D.289. These two carriages were together from 1918 until 1920, when no. 3726 was worked solo as Compo Motor Set 24. As such it was assigned to the Oldham/Stockport/Delph workings, and finished its days on the Delph branch in March 1955. No. 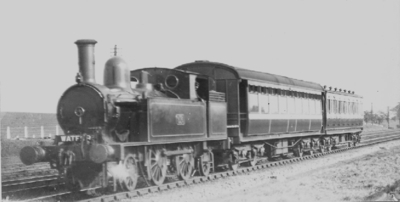 181 was also loose from 1920, and in 1925/6 was paired with LMS no. 5590 (M.62) as Third Motor Set no.13. It lasted until 12/44. This appears to be on the down New Line before it was electrified, but I cannot place it exactly (between Wembley and Watford Junc). Therefore the photo must date between Feb 1913 and early 1917. How does this tally with the idea that the coaches were together from 1918 to 1920? I might further note that, although very different vehicles, nos. 3726 and 181 seem to have started on motor train duties about the same time. As Philip notes, it seems likely that no. 3726 was a design prototype for the electric stock when it appeared in July 1914. No. 181 may have been converted between 1910 and 1916 (there were 13 such coaches by 1916, 16 by 1920, but only 4 of these were driving trailers) and could have been delivered for the New Line service. Similar but unique vehicle no. 3727 built in 1916 may also have been for the New Line services. These coaches were known to have run together from 1918-1920. They may well have been together before that as well, but records are sparse following the loss of the Wolverton Register in a fire at Derby in 1950. I agree that the photo date must be 1914-17.